Hello all! 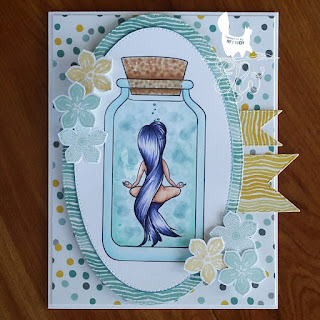 Another sketch challenge is up in the Paper Crafting Support Group! We all used an SBS image called Butterfly Betsy. 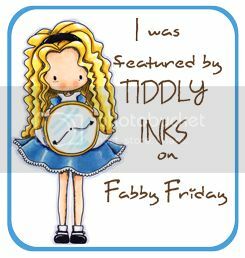 You can find Simply Betty digital stamps on the SBS site or some exclusive SBS images on our PCSG friend's page, Angels Hearts and Memories. She was kind enough to donate the image for our challenge. The papers are from Michele R Designs, Butterflies & Hummingbirds collection. I coloured the image with Copics. The die cuts are from By DieZyne. It's new release day at The East Wind, and today we have "Bobbed". She is full of attitude! I couldn't wait to colour her up. I coloured the image with Copics. I stamped flowers using Everything Eleanor rubber stamps by Stampin' Up on black paper with black ink and then used clear embossing powder to make them pop. There is a new contest in our Facebook group with the theme "I've Been Framed!". See my earlier post for this HERE. 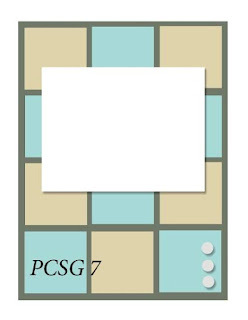 There are digis to be won so drop by the group and show us your take on the theme. The post is pinned to the top of the page! There are also twice monthly challenges on the blog HERE. Check them out and sign up for the newsletter while you're there to get your freebie image on the 1st of every month. We just posted a new kids colouring contest using Aurora "Spring Butterfly" too. Check the post for a special 60% discount on the image (you'll need to be a member of the TEW Facebook group). Time for a new challenge in our Facebook group for The East Wind. This month's theme is "I've Been Framed". 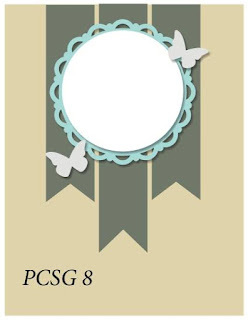 You have to incorporate a frame or make it look like a Polaroid for this challenge. I bought a little wooden frame from Michaels and coloured up "Witchery" for my project. I covered the frame with gesso first, then I used Lindy's Stamp Gang Sprays in Azure Sea Asters, Pretty in Pink Pink, and Gag Me With A Spoon Gray. 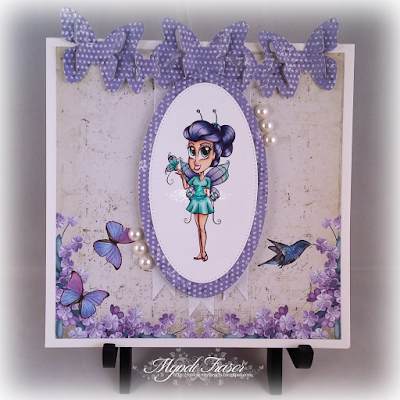 The wooden butterfly is from Michaels Recollections brand, and the flowers are from Wild Orchid Crafts. I added a couple little pearls and rhinestones, and Voila!! Done. There are so many fun things you can do with a theme like this, so please join us on Facebook and show us where your imagination takes you! Big News!! I was asked to be a guest designer at Aurora Wings this month for the Anything Goes Challenge, and as you can guess, I was beyond flattered (and excited)!! 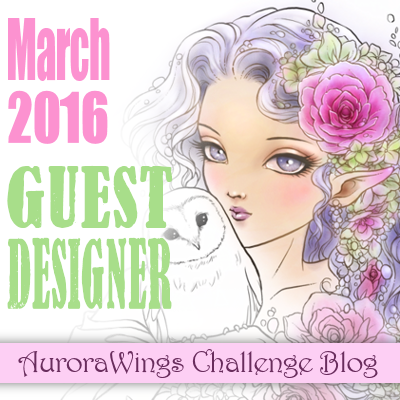 Mitzi Sato-Wiuff, the artist behind Aurora Wings, is celebrating the two year anniversary of the Aurora Wings Challenge Blog this month, so things are going to run a little differently for this challenge. The ATG challenge that starts today is going to have TWICE as many winners as usual. That means that there will be 2 ACA winners, 2 random winners, and 6 DT's picks!! How awesome is that? Before I get to my project, I want to tell you about some "crafting for a cause" going on in the Aurora Wings Facebook group HERE. Mitzi is sponsoring a fundraiser until April 3, 2016, on YouCaring to help with conservation of the Slow Loris. 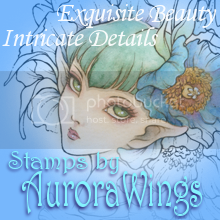 As a thank you for donating any amount to her YouCaring fundraiser she is offering a gift of a digital stamp drawn specifically for this event, "Slow Loris Sprite". If you donate a minimum of $10 you also receive a "Slow Loris in Leaves" digital stamp. Both of these images are Special Edition and will not be offered in her store at a later date. With these Special Edition stamps you can enter the Slow Loris colouring contest in the Facebook group until April 10, 2016. The prizes are as follows: One Artist's Choice Winner ($30 USD in digis + blog badge), one random winner ($30 USD in digis), top 5 (2 digis per person + blog badge), honorable mention (blog badge). All participates in this contest will also receive a 'special mention' blog badge for supporting the cause. All of the details about the fundraising and some awesome Design Team inspiration pieces can be found on the Showcase blog HERE. And now to my project!! 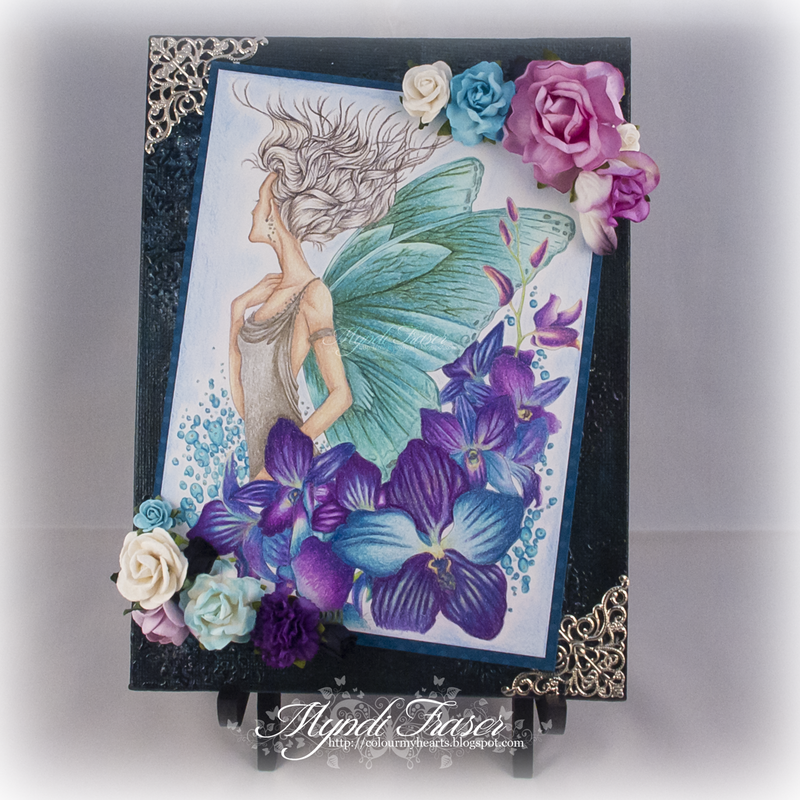 I created a little canvas with Orchid Fairy with detailed Butterfly Wings - Shades of Blue. I coloured the image with Prismacolor pencils. 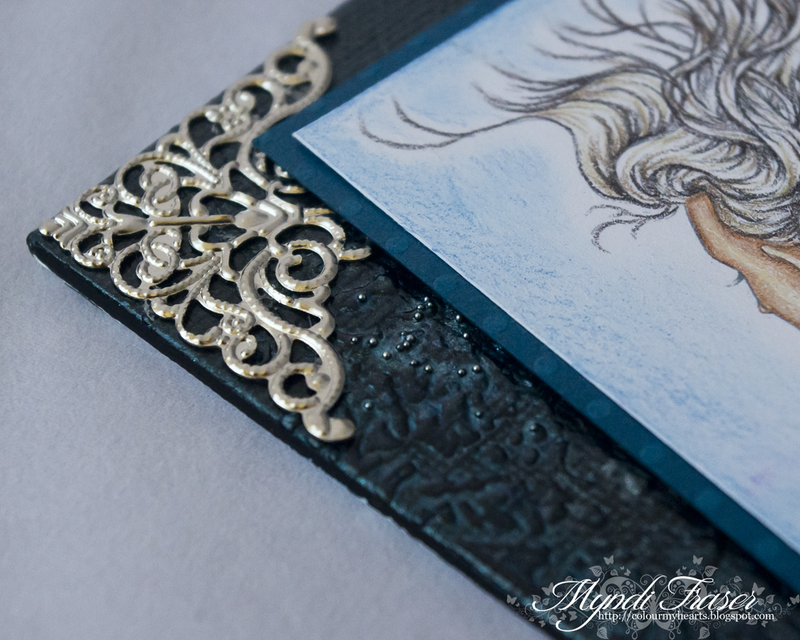 To create the canvas I put down a layer of black gesso on a 5"x7" canvas. After the gesso dried, I used Faber Castell Gel Medium and a Tim Holtz Doily stencil to create some texture. Before the gel dried, I added little metal beads hoping they would adhere and dry in the gel (which they did!). 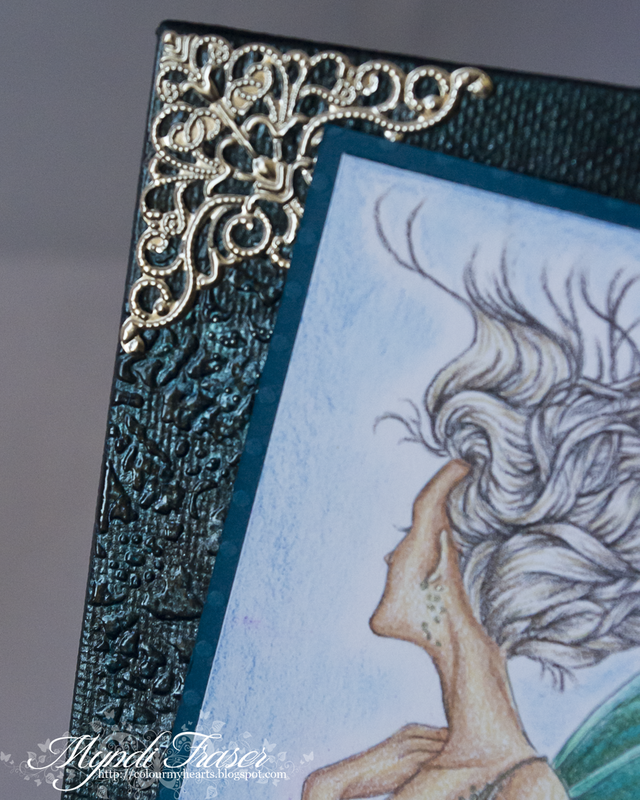 After the gel was dry, I used Lindy Stamp Gang sprays in Hydrangea Blue and Lucky Shamrock Green, to add some shimmer and subtle colour to the canvas. I tried to stay in the same colour families that I used on my image so as not to distract from that. 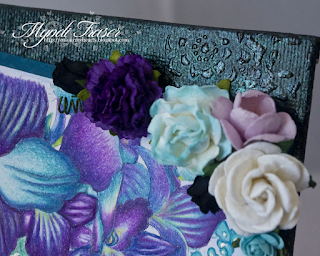 I added two small silver metal filigree corner embellishments before affixing the image on the canvas. 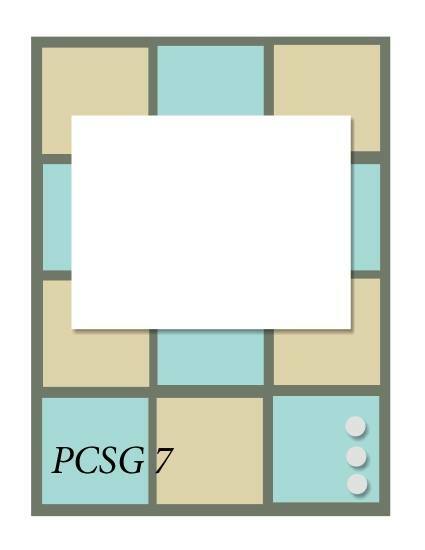 I almost always like to go a little crooked and off center when placing my image on a project. Maybe because I'm a little off center. haha!! I can hardly help myself. It just looks too neat and tidy to me otherwise. As a final touch, I added some mulberry paper flowers to the corners of the image, again staying in the same colour family as my image. Time for a new sketch challenge in the Paper Crafting Support Group on Facebook. We have a mystery prize this week, so who knows what goodie will be won at the end. I didn't colour an image for this challenge. Instead I stayed true to the sketch and made a more masculine card for my husband's birthday. It's always hard to come up with ideas for cards for him. I don't know why. 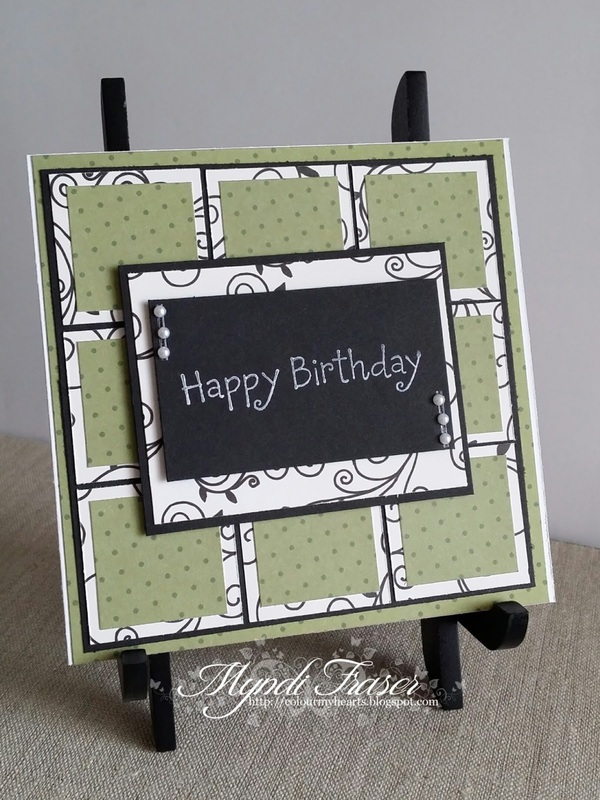 It's a pretty simple and straightforward card, so if you are just beginning card making, it's super easy to do. I mean, who can't cut squares, right? I just used my paper trimmer to cut all the squares, layered them and adhered them to a black mat. 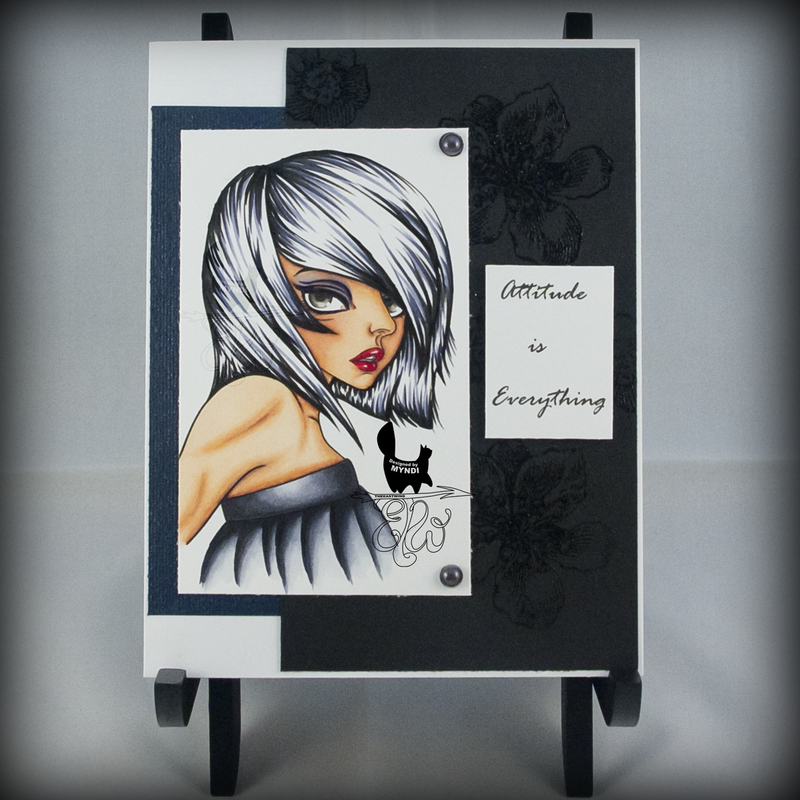 I used one piece of double sided paper from K & Company Black and Ivory DP. Check out all the other inspirations in the group or on our fearless leader's blog HERE. I hope you will join us on Facebook for this new challenge. It runs from March 12-26. We look forward to seeing your projects! 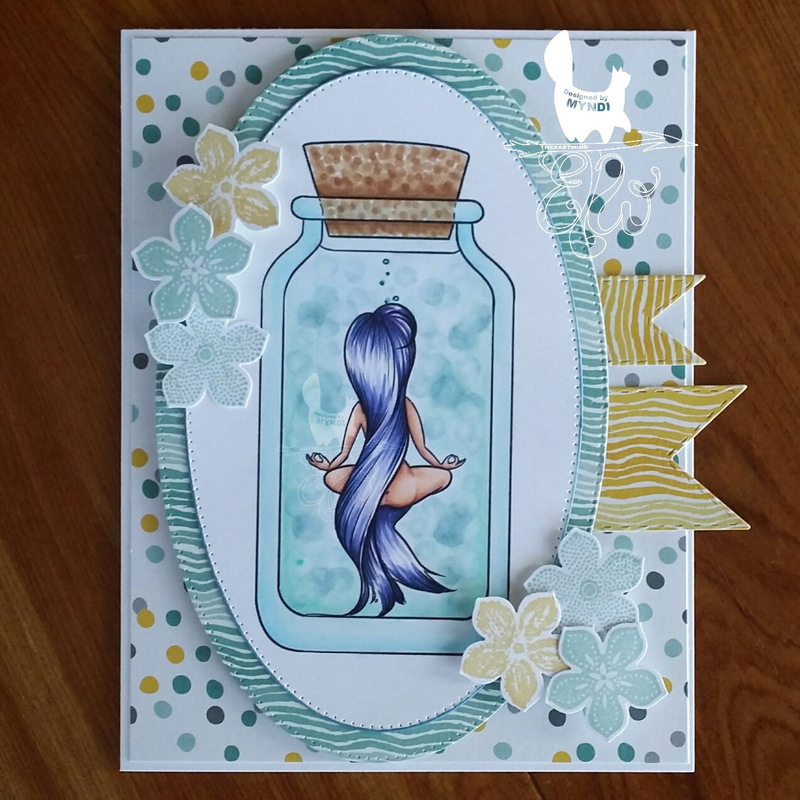 Today's new release is "Merditation", a mediating mermaid. BUT... I didn't get that she was a mermaid when I coloured her. Oh well, that's art for you: it's open to interpretation! 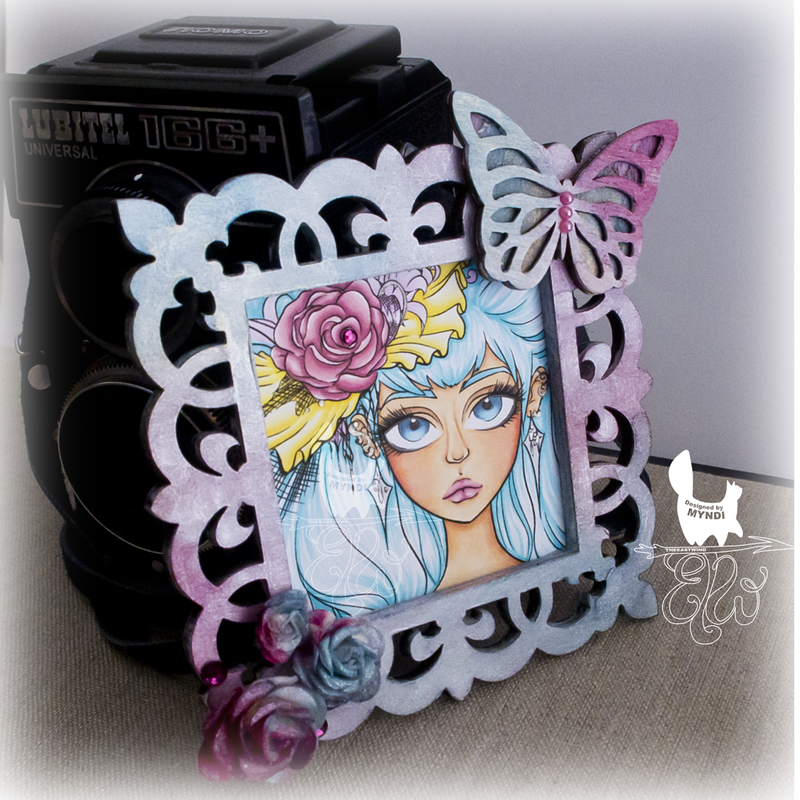 I coloured the image with Copics, and all my papers are from Stampin' Up. 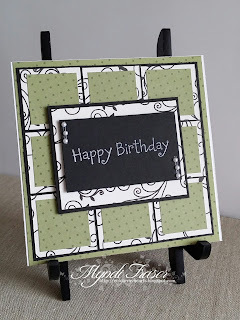 I also used the Petite Petals rubber stamps and paper punch, which are perfectly coordinated. I just stamp the flowers and then punch them out. Easy peasy! I also used inks from the Subtles collection. I used stitched oval and stitched flag dies from By DieZyne. 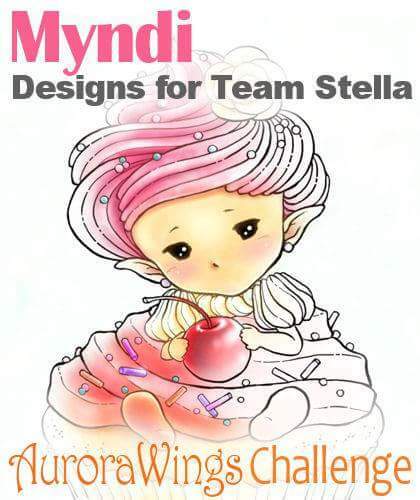 There is still some time to join in on our challenge this month at our Facebook group HERE. The theme is With Heart. Check it out! Thanks for stopping by!